I love the idea of quilted Nani Iro double gauze as a fall/winter fabric. I think it will make a smashing coat, especially with this simple design. My brain is now considering a quilted double gauze sweatshirt… thanks for the inspiration! Yum, that’d be very lovely too. I’ve had a hard time getting my hands on quilted nani iro as well. And I cannot believe how strikingly similar are coat plans are. I was planning to lengthen the Bernadette but just came across a very similar McCalls pattern today. (M7257) so o may try that one first. Good luck with yours! Wow, if ever there was off-putting fabric choices on an envelope as M7257! But yeah, the silhouette looks right. In a strangely coincidental way, I am making a fall jacket out of an Echino cotton/linen print which I’ve quilted using a thin wool batting sandwiched between that and some fusible interfacing. I’m using the Papercut Waver jacket pattern. The whole thing will be lined with silk charmeuse. The quilting was done in a diamond pattern with 3″ spacing. I’m really happy with it so far. I can send pics if you’d like. Sounds gorgeous, I’d love to see. Just wanted to let you know that I’ve finished my jacket and posted a review with pictures on patternreview.com if you’re interested. Not sure why this site often seems to rotate the pics 90 degrees, sorry! I found it – great job! So bright and cheerful. When did you quilt – before or after cutting your pieces? After. I was worried that this might affect the size but it turned out fine. I highly recommend the wool batting, btw. It’s preshrunk, washable, extremely light and lovely to sew. Good to know, thank you. I think I am going with some fusible poly batting. 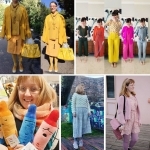 You have taken a really interesting approach to the theme of Slow Fashion October, and I like it! I haven’t done anything about it yet, because I haven’t yet figured out how I want to participate. Your coat sounds amazing! I think my approach is not quite what the main focus for the month is, but I’m glad to take my own inspirations from the theme. I can’t wait your slow coat! It is going to be gorgeous! Good luck! 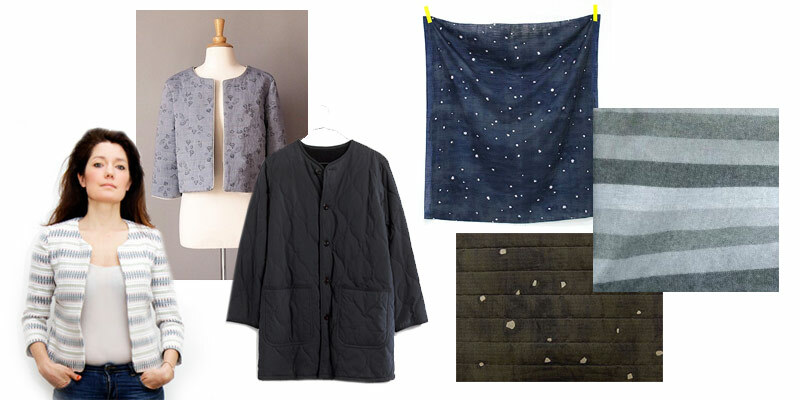 Love the idea of quilted Nani Iro, can’t wait to see your jacket! 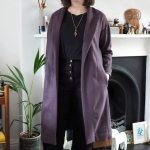 I’ve been planning a coat and jacket to get me through the winter, just need to order hte fabric and get started – my winter coat is really just getting beyond passable. Good luck – planning and getting started is usually half of the total time, I find. That IS marvellous. Looks like she used flat-fell seams like I plan to do. Sounds lovely. I was going back and front over a hood, but my fabric won’t be waterproof anyway so i’ll just have to carry a brolly! Your coat plans sound awesome. It’ll be sooo snuggly. The fabric you’ve chosen looks fab too. Looking forward to seeing the finished results. The little swatches are SO snuggly – I keep petting them! I’ve been planing to make something similar using the Named Esme cardigan as a starting point and the Rachel Comey Olympia jacket as a guide. I think the drop shoulder is right and I’ll crop it at hip length. Be careful with the reversible thing, it’s possible to do but sometimes the wearability suffers. Like finishing the seams to look good on the inside leads to a shoulder that doesn’t hang well. Anything which is reversible will have a preferred face so you might not gain that much. But if you do, what works for pockets is a horizontal welt on one side covered by a patch pocket as bag on the other. That sounds lovely. Good point – I’m prepared to sacrifice reversibility if it’s not likely to work. But I’m going to test the flat-fell idea and see if it’s feasible. Sounds like it’s going to be an amazing finished product! 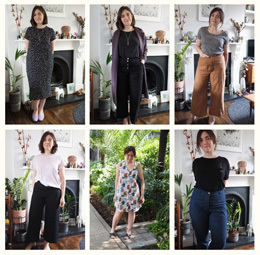 Sadly coming into summer all I want to do is sew everything summery right now! So I’m not slowing down this month in a literal sense, but I find sewing slows and calms my brain down anyway so I enjoy that mindfulness aspect all year round, like most of us I suppose! True indeed! In fact I was careful to not make much summer stuff as I know it doesn’t get much airing time over here, ha ha, so looking forward to a season where I can indeed sew some useful things! This looks like a really lovely plan Katie! I love the look and feel of quilted jackets and that Nano Iro double guaze is divine! What is your plan for closures? I think I may just leave it open as I don’t close up my coats too often. I think the Bernadette has instructions for an optional zip so I might consider adding one of those to the front. But it’d have to be reversible, hah! I love quilted jackets; looking forward to yours. A reversible coat sounds great!